BETWEEN TIME AND TIMBUKTU: A SPACE FANTASY (1972). 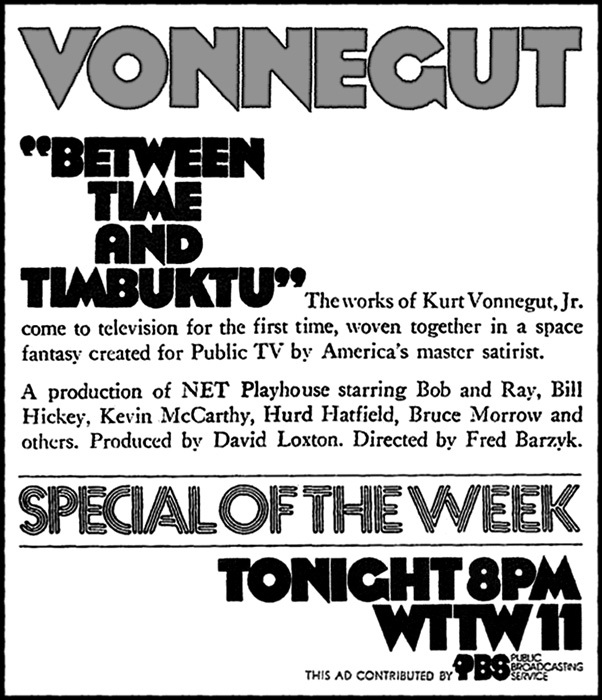 Originally produced for public-TV and broadcast on March 13, 1972 (after which it was rented out for stoned college screenings throughout the mid-'70s), this hodgepodge of unrelated Kurt Vonnegut Jr. ideas is cheap, loose and often a mess. But amidst its absurd comic moments and SF-draped political satire, it's obvious that director Fred Barzyk (THE LATHE OF HEAVEN, '80) truly respects the original material. It's not the best interpretation of Vonnegut's work, but it's far, far from the worst... Has anyone else survived SLAPSTICK (OF ANOTHER KIND) starring Jerry Lewis?! When shy amateur-poet Stony Stevenson (PRIZZI'S HONOR's William Hickey) wins the Grand Prize in the Blast Off Space Food Jingle Contest, one of the not-so-welcome rewards is a rocket trip aboard Prometheus-5 to the Chrono-Synclastic Infundibula (defined by Vonnegut in "The Sirens of Titan" as "where all the different kinds of truths fit together"). Unable to control his trajectory throughout time and space, reluctant Stony is dropped into various strange and nightmarish societies -- randomly cobbled together from Vonnegut's short stories and novels. A seemingly utopian world has Kevin McCarthy as its hippie-prophet Bokonon, until pleasure is outlawed and their leaders exposed; a Doctor (Hurd Hatfield) and General (Dolph Sweet) bicker over warfare, science and "Ice-9", which could end the world as we know it (both from "Cat's Cradle"); a political dissident is on trial for his life ("Player Piano"); suicide parlors promise bliss to citizens tired of an overcrowded world, with FALCONCREST's Susan Sullivan as a death hostess; and people are artificially handicapped by the government, so that everyone is equally average, until escaped rebel Harrison Bergeron takes over live-TV with an "indecent" display of artistic superiority (both from "Welcome to the Monkey House"). Stony eventually makes a quick visit to heaven, complete with a parade, Wanda June and Hitler, and ends up being wiser than originally anticipated. The entire project has that distinct '70s-PBS vibe -- its production values are cut-rate, its special effects low-tech, the direction is uninspired -- but that's offset by an appealingly heartfelt quality and Hickey's odd but ideal casting. Meanwhile, some of its best throwaway moments belong to comic legends Bob (Elliott) and Ray (Goulding), who play TV-commentators for Stony's trip and ended up ad-libbing their most amusing banter. 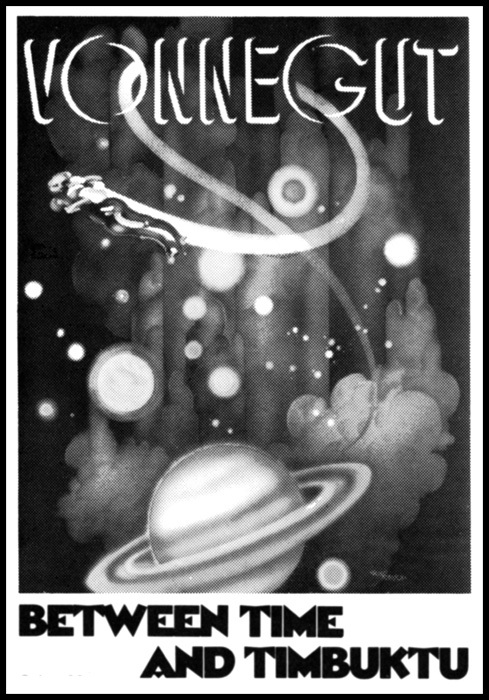 Despite its weaknesses, the film was nominated for a Hugo Award for Best Dramatic Presentation and Vonnegut was apparently pleased with the end result, since its teleplay was published under his name.